On 27th October 1866 the Adelaide Observer reported that the Board of Education had received a letter from Mr John Forbes 'notifying on behalf of the residents of Grace Plains that they had appointed Alexander Lawson to the headmastership of the Grace Plains School, as successor to Henry Warwick, resigned'. On 10th October 1868 the same newspaper reported that the school inspectors had been 'quite satisfied' by the performance of the children at the school. On 14th April 1877 it was reported that Alexander Lawson had been transferred to the school at Barraba. The Methodist Grace Plains School is recorded to have originated in the Methodist church when it opened in 1868. In April 1875 Mr Matthew Adams, who was Clerk of the Grace District Council wrote to the Central Board of Education seeking a subsidy to build the Grace Plains School. An additional source has the list of teachers commencing with Samuel Myers to Ellen Cullinan and the list of teachers reflects the corrections. 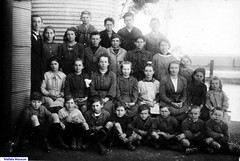 From 1919 to 1928 the schoolteacher was Mr Frank W. Ray and about 25-30 students attended. Subjects taught were reading, writing, arithmetic, spelling, drawing, sewing for the girls and woodwork for the boys. Children would walk to school or ride or drive ponies. For morning assembly a whistle was blown, the children lined up, and the teacher checked for clean hands and fingernails. The flag was raised and the children saluted the flag. The children were seated in long desks seating six to eight pupils, and any child who misbehaved had to stand out in front with his or her back to the class. 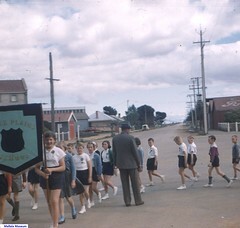 Children attended until they were 14, some repeating grade 7 to bring them to this age while others attended colleges in Adelaide. A few attended the newly established Balaklava High School, boarding in Balaklava during the week. Miss Nell Tiller was the first Grace Plains girl to attend the new high school. In 1969 Grace Plains School closed down, the last teacher being Miss Patricia Beinke. There were 10 students at the school who continued their education at the Mallala school. Life around the Light: A history of the Mallala District Council area. 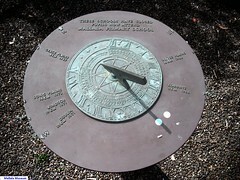 compiled by Two Wells. Mallala and District History Book Committee. Community Development Board of the District Council of Mallala (Mallala. S. Aust.) 1985. Willastonlad remembers: When my Grandfather Candido Celeste Mazzarol enlisted in 1915 his father was shown as Victor Mazzarol of Grace Plains. 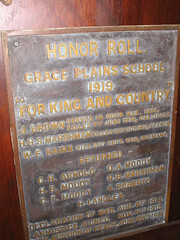 Victor J. Mazzarol was Headmaster of the Grace Plains School in 1916 and 1917. Candy was awarded the Military Medal for bravery under heavy artillery fire at the junction of the Ancre and Somme rivers on 24 April 1918. He went on to become the Gawler Institute Librarian for many years and was Secretary of the Gawler Trotting Club. He died in 1960. Do you remember Grace Plains School ? Then Join up and add your memory here.